Most common health problems in Shih Tzus, plus health care and feeding. If you want to AVOID health problems in your Shih Tzu, you'll find my health care program very valuable. If your Shih Tzu already HAS a health problem, I'm sorry to hear that. You should immediately begin my health care program, and you may be able to restore his good health – or at least make him much more comfortable. Let me help! Shih Tzus are deliberately bred to be deformed in two ways – their short legs and long back are chondrodysplastic and their short pushed-in face is brachycephalic. Both of these syndromes are associated with numerous health problems. A long list of serious eye diseases leave many Shih Tzus blind or vision-impaired. A serious kidney disease called juvenile renal dysplasia, can kill young Shih Tzus. A congentital liver disease called liver shunt is a major concern in Shih Tzus. Chronic allergies cause itchy skin and scratching, which often leads to bacterial infections (hot spots). Ear infections are common due to profuse hair in the ear canals. Shih Tzus are very prone to urinary stones. These can be life-threatening in male dogs because their long narrow urinary tract can easily get blocked. Bad joints affect the Shih Tzu, especially bad knee joints (luxating patella) and bad hip joints (hip dysplasia), and also intervertebral disk disease. All of these orthopedic diseases cause pain and lameness and can require expensive surgery. Some health problems are inherited. For example, if both parents of your Shih Tzu have certificates proving they were tested and cleared of hereditary eye diseases, hip dysplasia, and renal (kidney) dysplasia, your Shih Tzu has less risk of developing those conditions. Other health problems can be prevented, or partially prevented, by the ways you raise your dog. If you're serious about doing everything you can for your Shih Tzu, my best-selling book, 11 Things You Must Do Right To Keep Your Dog Healthy and Happy, shows you how to raise your Shih Tzu puppy (or adult dog) in all the right ways. It will help you be your dog's health care champion! Read my advice on daily health care so your Shih Tzu lives a long, healthy life and seldom needs to see the vet. How many vaccinations does your Shih Tzu puppy really need? Does your adult Shih Tzu need yearly booster shots? The vaccination guidelines have changed! Find out what some vets aren't telling you. Dogs are not supposed to have short legs, a shortened muzzle, and a long back. These deformities are called chondrodysplasia and brachycephaly. Both of these syndromes are associated with a number of health problems. The Shih Tzu's prominent eyes are easily scratched, leading to corneal ulcers. Other eye diseases include juvenile cataracts, progressive retinal atrophy, entropion, dry eye, glaucoma, eyelash abnormalities (which are particularly persistent and difficult to treat in Shih Tzus), cherry eye, retinal dysplasia, and tear duct disorders. A serious kidney disease, renal dysplasia, can kill Shih Tzu puppies before a year of age. 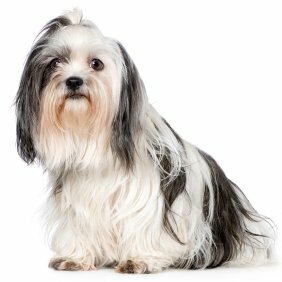 Shih Tzus are prone to urinary stones, which are especially dangerous in males. Allergies cause itchy skin and often lead to bacterial skin infections (pyoderma). Ear infections are common due to profuse hair in the ear canals. Liver shunt is a concern in Shih Tzus, as is liver disease (chronic hepatitis). Orthopedic health problems include luxating patella (loose knees), intervertebral disk disease, and hip dysplasia. The Orthopedic Foundation of America evaluated the hip X-rays of over 675 Shih Tzus and found 21% dysplastic. That's a dreadful rate for a small dog. A digestive disease, pyloric stenosis, occurs in the breed. Two health problems in Shih Tzus are related to the blood: blood-clotting disease (von Willebrand's) and autoimmune hemolytic anemia. Shih Tzus also seem to be predisposed to low thyroid levels and hernias.